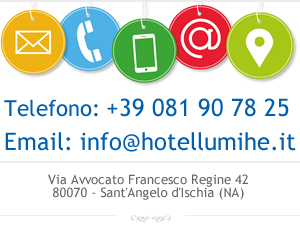 Dear guest, this frase is our motto, to garantie your vacation in Hotel LUMIHE. If a tranquil and peaceful atmosphere is what your looking for than we have the perfect accomodations, situated on a quite serene south side hills of the Island, and kissed by the sun. The village of S.Angelo is 20 minutes walk.